Disclaimer: The information contained in this post is accurate for LSCWP v1.5. If you are using a newer version of the plugin, some details may have changed. Please refer to our wiki for the latest! LiteSpeed Cache for WordPress has the ability to support your Content Delivery Network usage. This refers to reverse-proxy CDNs only. If you are using Cloudflare, which is not a reverse-proxy, but actually a distributed proxy server, then you do not need to do anything special in your WordPress setup. You can use Cloudflare and leave the CDN tab disabled. For the rest of you, this quick guide should explain how the different settings between your CDN and LiteSpeed relate to each other. For this guide, we’re going to assume you have already set up your CDN account, and added your site (let’s call it example.com) according to the CDN’s instructions. Make sure that your CDN is configured to cache static files only. Dynamic content will be handled by LiteSpeed. Your CDN configuration screen should have an area for adding a CNAME record. Look for it under “DNS Editor” or something along those lines. The goal here is to set up a custom domain to be used only by the CDN. For example, cdn.example.com. Follow the CDN’s instructions for adding the CNAME record. Once that is complete, and the domain is active, we’ll be ready to tell WordPress how to proceed. Now that your CDN is set up and your static content is ready to be served by the CDN, you will need to let WordPress know about it. You can do this through LiteSpeed Cache. 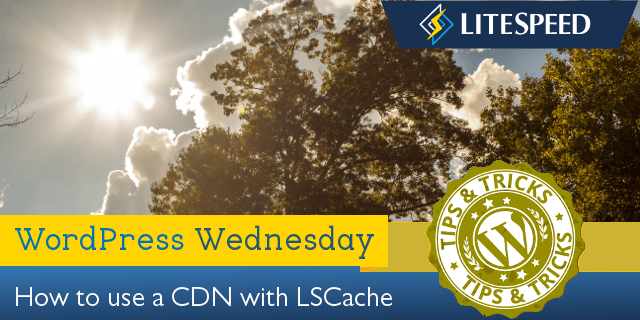 In your WordPress Dashboard, navigate to LiteSpeed Cache > Settings > CDN. Set Enable CDN to ON. Set CDN URL to http://cdn.example.com. Set Original URL to //example.com. The remaining settings can be used to let LSCWP know which static files will be served by your CDN. And that’s it! Once you save your changes, LiteSpeed Cache for WordPress will substitute the CDN URL for the Original URL in the static copies it saves of your dynamically-generated code, wherever appropriate. Want to learn more about how all of this works? We’ve written about our CDN support in some depth before. You can check that out here. Does LS support multiple CNAMES for CDN use? CDN1, CDN2, CDN3 (For example). Many sites I own, I will parallelize the traffic across multiple CNAMES. The WordPress plugin only provides a space for one single CDN URL. So for the moment, no, LSCWP’s CDN support doesn’t extend to multiple CNAMEs. You’ll need to continue using a separate plugin to manage your CDN. Hope this helps! I’m also using cPanel and for this to work I have created a subdomain of itraveille.fr (cdn.itraveille.fr) then also add a CNAME entry in cPanel. Hi, Pascal. When I try to visit either the CDN url you specified (cdn.www.itraveille.fr) or the other URL (cdn.itraveille.fr) I get 404 on the former, and 403 on the latter. I’m not entirely sure how cPanel fits into all of this, so it might be necessary to create a ticket, but before you do that, can you verify that cdn.www.itraveille.fr is indeed your Cloudflare URL? If it is, I should be able to visit it directly without getting a 404. My apologize, I have entered a wrong URL for CDN, it is url : https://cdn.itraveille.fr I just updated it and cleared Cloudflare and Litespeed caches. I must admin that I do no understand the goal of this method? I tried to test it, but what are the benefits? Let me see if I can illuminate the goal a bit. In order for a CDN to work with WordPress, you need a plugin that will inform WP to replace certain links with CDN links. That’s basically what the Cloudflare plugin does. If you use LSCache instead, it’s doing the same thing. When you specify your CDN URL, and choose the types of files to be served by CDN, you are giving LSCache the parameters for replacing native links with CDN links. Without a plugin to tell WP to replace the links, nothing would ever be served from CDN. Looking again at the cPanel thing, and remember I’m just guessing here, but cdn.itraveille.fr should not point to your site at all, but to Cloudflare. I feel like folder level doesn’t apply. Hi! I’m sorry to hear that. We can help, but we’ll need additional information. Would you mind creating a ticket (or send email to bug at litespeedtech.com)? Thanks! Great update, Lisa. Question: How does the official Cloudflare WP Plugin factor in? It’s a one-or-the-other situation. So, either you use the Cloudflare WP plugin and de-activate that functionality in ours, or you use LSCWP and uninstall theirs. I have new information on this, and I thought you should know. I misspoke originally. Neither plugin is actually required for Cloudflare to function. Disable CDN in LiteSpeed if you’re using CF. You can use the CF plugin, if you like their WP tools, but it’s not strictly necessary. Apologies for any confusion!